FALLING WATERS, W.Va. – Officials from WVU Medicine University Healthcare Physicians (UHP) and WVU Medicine University Healthcare gathered on Wednesday, January 18, with community representatives for a groundbreaking ceremony to celebrate the future site of the Spring Mills Medical Office Building. The three-story, 40,000-square-foot facility will be located off Interstate 81/Exit 20 on 3.57 acres at the intersection of Route 11 and Campus Drive. 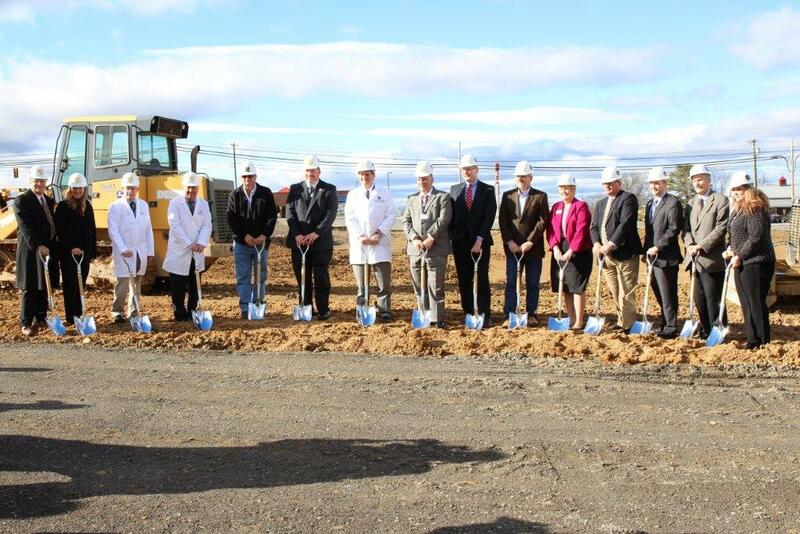 Owned and operated by UHP, it will house an urgent care, orthopaedics and sports medicine, primary care, and specialty clinics. “This WVU ambulatory medical center features unique design elements that will foster our healthcare professionals working as teams, provide us with room for growth of services in a shelled-in third floor, and bring expanded access to primary care and specialist care in our growing northern Berkeley County,” stated UHP President and CEO Konrad C. Nau, M.D. “I think the staff and the patients will appreciate the color and brightness of our environmentally green design elements. Best of all, we love being located in the heart of Spring Mills school and shopping district and look forward to being an integral part of this community,” he added. WVU Medicine University Healthcare officials announced they plan to lease space in the building to establish various satellite services of Berkeley Medical Center. According to President and CEO Anthony P. Zelenka, University Healthcare plans to offer rehab services, a women’s imaging center, and lab/X-ray services to support the physician practices and urgent care. Brechbill & Helman Construction Company of Chambersburg is the contractor for the $11 million project, which is expected to be completed in early 2018. The building was designed by Grove & Dall’Olio Architects of Gerrardstown. Photo caption: Matthew Grove and Lisa Dall’Olio of Grove & Dall’Olio Architects; Jeffrey Stead, M.D. ; UHP Board of Directors; George Harris, M.D., M.S., Medical Director of UHP Primary Care Clinics; Steve Mixell of Brechbill & Helman Construction Company; Aaron Henry, VP of Operations/Chief Operating Officer of UHP; Konrad C. Nau, President/Chief Executive Officer of WVU Medicine University Healthcare Physicians (UHP); Anthony P. Zelenka, President/Chief Executive Officer of WVU Medicine University Healthcare; David DeJarnett, WVU Medicine University Healthcare Board of Directors; Dan Dulyea, Berkeley County Council; Tina Combs, Martinsburg Berkeley County Chamber of Commerce, Tim Pownell, United Bank; Josh Householder, BCT; Delegate John Overington; and Kathleen Stotler, representing Senator Shelley Moore Capito, break ground on the Spring Mills Medical Office Building.